I always find it somewhat interesting how some motorcyclists really enjoy wearing full track suits with matching helmets on the open road. When you're on the track, it makes a lot of sense -- but honestly, I think that some riders feel like if their helmet is multi-colored and really stylized, then they have to the gear that matches. But what about when you just want to ride without all the pizazz? 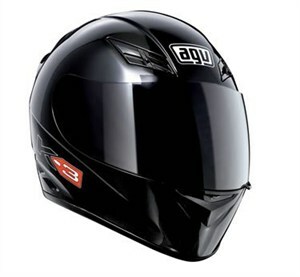 The AVG K3 Full Face Motorcycle helmet is streamlined for a smooth look that will fit most every style of bikes. There really aren't a lot of graphics or markings on it, keeping a simplistic yet attractive look. One thing I like is it features a short neck in the back, perfect for sports bike riders. It's easy to get low and lay on the tank without having to keep your head in an awkward position. The removable interior padding is covered with the Dry-Lex hygienic treatment, which will help with odors and keep it smelling as fresh as a daisy in there. The face shield is nice because it's bigger than average, which gives you a better field of vision as well as being treated for anti-fog and anti-scratch. It can be removed and swapped out in seconds with the Extra Quick Release System (I know, corny name, but it works). The ventilation system contains the standard front air intakes and rear extractors; it's good to keep that fresh air coming in.